Hostel Management is developed for managing various activities in the hostel. As educational institutes are increasing day by day, accommodation for students is very necessary. Hostel management system can be used where there is complex number of students and there is a need of proper alignment of all the task and track records. The module is very user friendly and easy to use interface. Library Management system is specially developed for the librarian of the institutes, where they can Add new books, with Title, Author and Section code. They can Update the records for number of Books Issued and number of Books Returned through single user platform, also they can view the availablity of the Books through this system. The Librarian can view the total Books issued and Books returned daily, weekly and monthly basis. Our module display list of vehicle number,maximum seat allocation,insurance renewal date and driver's contact number and details. Parents/Teachers can track their respective allocated vehicles with the Vehicle Tracking System. Our module display area wise allocated route details and driver's name. 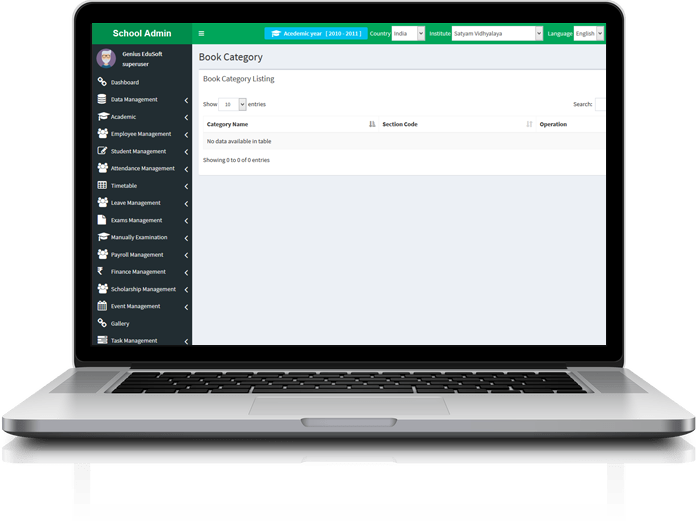 Create and Manage pick up and Drop schedule of the students, the system will give you customized annual fees structure with detailed specification for fees payment. Manage and allocate transportation with customized route management. Manage the list of all the books, its categories and total number of available books in the library. Manage book Issue and return process seamlessly for teachers and students. Create, Manage and Maintain Hostel Details with its facilities, live updates about students and other management facilities. Update food menu, maintain coupon records and deliver regular updates to students and staff. Simple and Quick Vehicle allocation with proper defined route and driver details. Real time Vehicle Tracking System. Easy to understand Annual Fees Structure with efficient payment modes. Accurate results from different Books and their Category. Monitoring Books Issue and Books Returns simultaneously. Manage and Handle all the Hostel activities on single platform. Students and Hostel staff can supervise Hostel Canteen food menu regularly. Predefined allocation of transport vehicles through managing their time and destinations.